Chelsea’s four wins from four Premier League games so far give them the only 100 per cent record this season. In winning their first four games, they become only the 16th team in 23 PL seasons to do so. On four of the 15 previous occasions, it has been Chelsea themselves achieving this feat: in 2004-05 the run stopped at four wins on the bounce, in 2005-06 it went on to become a run of nine straight wins, in 2009-10 it became six, and in 2010-11 it became five. Chelsea’s biggest test by far so far this season comes on Sunday when they visit reigning champions Manchester City, a club they have visited 17 times in the Premier League era (the ‘monied era’) in the league. In those 17 games, they have won 11 times, drawn once and lost five. It needs to be noted that four of the five defeats at City were in the four consecutive seasons from 2009-10, with that losing run ended by Chelsea’s single-goal win in February. 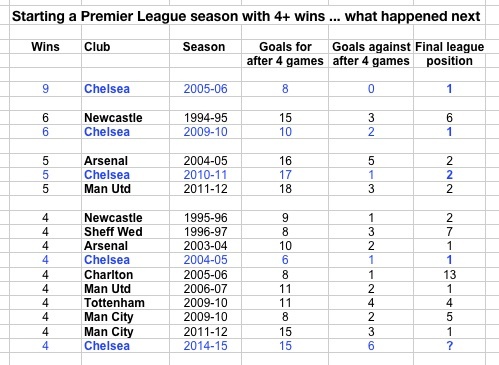 Chelsea have an enviable record against both Manchester teams in the Premier League overall. 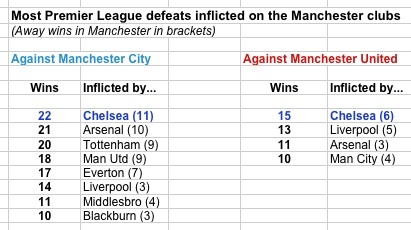 In fact they have a better record against both City and Manchester United than any other Premier League team. They have inflicted 22 defeats on City in the era, 11 of them at City; and beaten United 15 times in the era, six times at Old Trafford. Chelsea have the leading goal scorer at this early stage of the season in Diego Costa, who has netted seven league goals in four PL matches so far. Costa is one of 22 Spanish players to have featured in a PL game so far this season, and one of four who have scored. In total, 385 different players have made appearances for the 20 clubs and 22 of them (5.7%) have been Spanish. Of the 111 goals scored, 12 of them have been scored by Spanish players (10.8%) so they are punching above their weight as a group, underpinned by Costa. The 17 Argentinean players (4.4% of players) have collectively scored nine goals (8.1% of goals) and so are also punching above their weight. 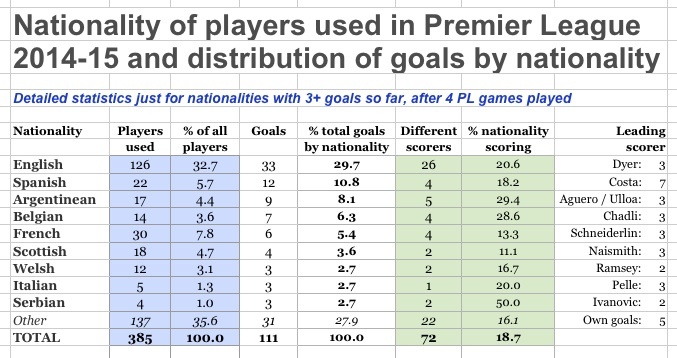 English players, 126 of them, have scored 33 goals between them, which is not many fewer than they ‘should’ have scored. Just under one in five of all players (72 of 385) have scored at least one goal, and just over one in five English players (26 of 126) have scored a goal so far.